While no set date for the upcoming version (1.11) has been set, a new snapshot is expected to go live this Wednesday, September 28th! In addition to the majestic llama, quite a bit of content is planned for the upcoming update, though it is not expected to have the same sheer volume of features as 1.10. The primary focus will be on Survival mode. A few features of the new update have already shown themselves in snapshots over the last month, but a great deal of secrecy surrounded 1.11 until today, with a rather substantial amount of information being shown, or spoken about, at Minecon. The list is pretty big - read on! Summons a stream of fangs coming out of the floor, damaging mobs. Spit their llama goo on wolves. When a lead is put on, surrounding llamas in a small radius will be attracted and try form a caravan behind the leaded llama. Sells maps, compasses, and Ocean and Woodland treasure maps. Crafted using a chest in the middle with 2 Shulker Shells, one above and one on the bottom of it. Can be placed down and has 27 slots. When destroyed, does not drop contents, but stores them in the block item, just like backpacks. Can not be placed in each other. Can be used with hoppers, droppers and dispensers, just like any other item. Break into item form when pushed with a piston. When opened, the top will spin up, similar to a Shulker opening. Will save your life when you receive a killing blow, while holding it in either hand. Gives regeneration and absorption for a couple of seconds. Shows a 'particle' just like the curse from an elder guardian. Golden ankh like animation whenever the item is consumed. Just like a map, except will show terrain outlines and a specific structure with treasure. When exploring, it will fill in the outlines. Can be bought from cartographers. Look like end gateways, but teleport you to the main island's spawn platform, instead of outwards to the outer islands. Can be found with a Woodland Exploration Map. Consists mostly out of wood. Basically Enchantments, but instead of a positive effect, carry a negative effect. Items with this Curse will vanish upon death, instead of drop, regardless of the gamerule keepInventory. Items with this Curse will stay on your player until they break, they cannot be removed manually. Death will make you drop this item. Locates the nearest structure, like EndCity or NetherFortress. Pushes coordinates in chat for the executor of the command. Seems cool, though it looks like Minecraft is moving more and more towards a fantasy theme. This isn't bad, but it does open the way for quite a few new suggestions. Hopefully the game doesn't become too much more like an RPG though. Can we just talk about how mod-like and fitting at the same time the new mansions are? Ahagh hagh hagh, I'm the hero of Hexxit! And yes, the new mansions are literally the coolest structure yet. The mansions would definitely look better if they had a yard area around them. From the footage at Minecon it looked too much like a large box just plopped down on the ground with no buildup for the detail. I love how well everything fits, while adding to the game at the same time. Which he didn't make half decent for a year. It wasn't finally fleshed out for 2 years after that, after he wasn't working on it anymore. I'm not saying he didn't make good things either, just that he isn't particularly a good developer. And for the record, one good thing someone did doesn't make them good. Hitler actually rebuilt Germany before he did horrible things. Ummm it wont have the same magnitude as the 1.10 update? 1.10 only added like 2 features so i hope its better than that. I think you meant the 1.9 update. The 1.10 cycle added quite a lot actually - fossils, magma blocks, nether wart block, red nether brick, polar bears, strays, husks, huge mushrooms, improved and themed villages, auto-jump option, endermen in the nether, falling dust particles, more spawn eggs, etc. Those are very minor changes. Except for the auto jump, they all probably only took a few minutes each to code. Not saying your reply to him is invalid, it actually is quite valid. What I really came here to say is maybe, it's only in quanity that the features of this update is less. 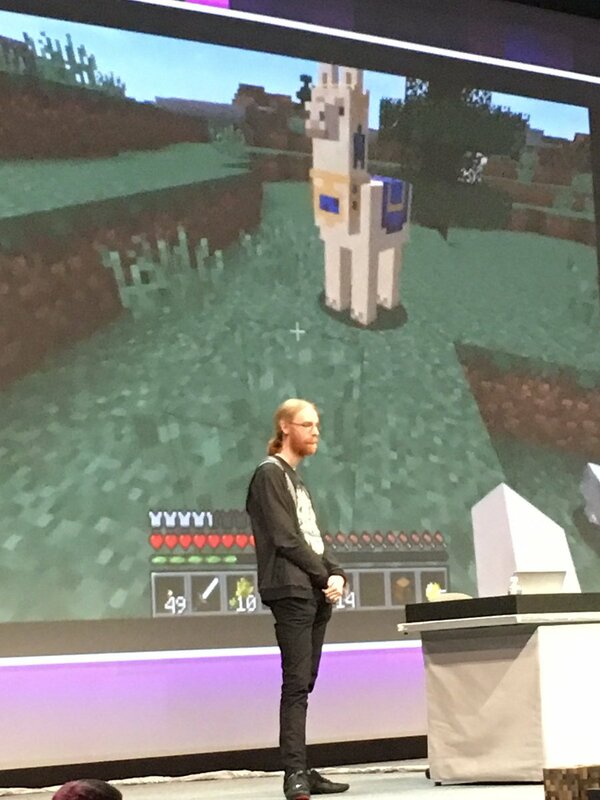 So far, 3 new mobs were shown that seem like they took at least a bit of time to code. Polar bear seems in my opinion, relatively simple to code. Strays & husks are retextured zombies and skeletons that don't burn in the sun. I feel like they have already added more actual work into this update so far than 1.10, just less amounts of features in exchange for intricate features. If this is all they added to 1.11, they didn't do much more amount of coding than 1.10, but I have a feeling this isn't all. they all probably only took a few minutes each to code. Considering Jeb spent months adding those things, I'd hardly call it "a few minutes each to code". I am actually a modder and a programmer, I would know. It takes about one line of code for each normal block that is the same on all sides. Colliding with a block was already implimented with cactus, all he had to do was copy over that method and change it to set the player on fire instead. Which, again is one line of code. Polar bears are a bit more difficult, considering you have to animate them, but still would take roughly an hour to code. Considering they are the actual devs of the game an should be familiar with the MC code inside and out, it probably took even less than that. I already said what strays and husks are, no reason to go deeper into that. Huge mushrooms? Just a slight change needed, they only made it possible for them to grow taller. A few lines of code at the most. Improved and themed villages? Considering they have made tools to help the out with structures, the most work was designing the new villages. Auto-Jump option? Simply check if you are colliding with a block that is only 1 high and facing it, if so jump. More code than the other ones, but still took an hour at the most. Enderman in the nether? One line of code. Falling dust particles? Only a few lines of code. I honestly don't know how particles work past 1.7.10 since they are no longer entities, but I am sure they would make it easier rather than harder to add them. More Spawn eggs? One line of code each and no texturing to even do. Ridiculously simple. Now I shouldn't have said "a few minutes each", because there are some exceptions that took up to an hour, but generally most of the changes took very little time. The update probably could have taken a week at the most counting bug fixes. I am not angry at them for being lazy, because every game gets this way after the devs are rich from it and it's been out for a while. Heavy feature adding is mostly during first release. I would probably be the same way if I owned a popular game, so not judging them. Just simply saying maybe for once they decided to make some intricate features. 1.11-13 will be minor updates, 1.14 will be a big one. A quick and dirty rough draft of each may have been just a couple minutes after running a macro or template. However Minecraft isn't a game of quick and dirty features, it's one that has features polished to work reliably, predictably and fit within the theme of the game. A lot of the bugs we see in the game are far more complex than what you generally see of quick and dirty code. They have also worked out a lot of bugs that existed for awhile and allowing larger amounts of commands/redstone signals at once likely has them optimizing code that was fine before but such limits usually are established as a result of some basic benchmarking or data type maximum value/precision.